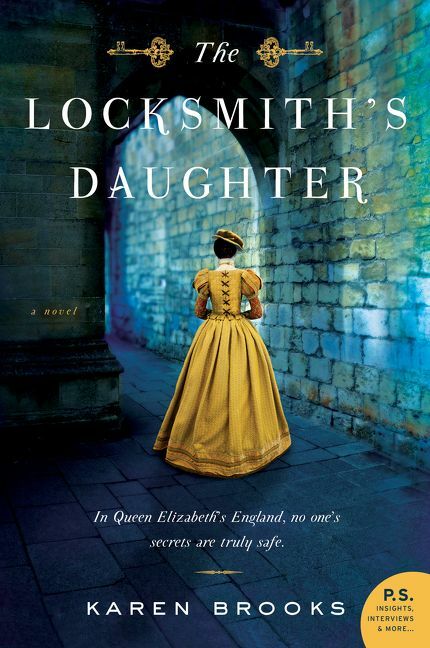 I return to my favorite reading genre of historical fiction – in a single timeline – with The Locksmith’s Daughter by Karen Brooks. It’s the tale of an extraordinary woman during the reign of Elizabeth I. I thank TLC Book Tours for sending me a copy at no charge for my honest review. Mallory Bright, when we meet her, is a damaged young woman who has returned home after a scandal of some kind involving a man. Her father has brought her back to their home but her mother would rather she be gone. Mallory would just like to disappear. The only thing that has brightened her life at all is her friend and a boarder at their house who happens to be a playwright. As the tension at home becomes untenable her father finds her a job with an old friend, Sir Francis Walsingham of all people. Mallory had spent her childhood learning from her father, a skilled locksmith. She is an equally skilled lock pick. Walsingham knows he can use her skills in his cadre of spies as he protects Queen Elizabeth from the harms that stalk her. Mallory takes quite well to her spy training but all is not as it seems in her life. She has sworn to never trust another man but there is one that seems at times to be the one to open her heart again. But she doesn’t know if she can completely trust him – until harm comes to those she loves best and she soon finds out exactly whom she can trust. I enjoyed reading The Locksmith’s Daughter. The tidbits here and there describing the beautiful and complicated locks of the time were truly fascinating. It’s always fun when the protagonist is a bright and intelligent woman even when it seems completely implausible given the times. Half the fun of reading is to imagine what might have been – particularly with fiction books. Walsingham is known in history for his spy network in support of the queen. He had people all over feeding him information as he fought off the enemies trying to return the Catholic faith to the realm and place anyone else on the throne. I can believe he would utilize a woman in his network. Whether he would have done so as freely as he did in this book, I don’t know but to understand the whys of that you will just have to read the book. It is a novel with a cast of interesting characters and Ms. Brooks’ research shows in the way she sets her scenes. They are fully realized and interesting – in a strikingly modern way which does cause one to pause. But it’s fiction and the book is an enjoyable read. It does have some unpleasant scenes that take place in the infamous Tower but they are not as descriptive as I have encountered in other books. I did wonder to myself if they were necessary but I’m a reader, not a writer.